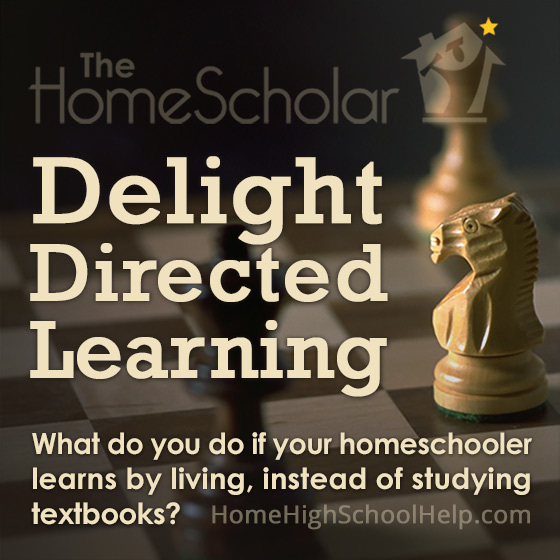 Delight directed learning makes homeschooling better for everyone involved. For parents, it reduces burnout, improves children’s cooperation, and develops self-motivated learners. For children, it increases the love of learning and makes learning more relevant and meaningful. Delight directed learning will shape and mold your child’s career goals, lead to great experiences that can be put on the transcript, and helps create a fabulous resume. It can improve your child’s chances of earning college admission, scholarships, and job opportunities - all while still in high school. Delight directed learning is sometimes called specialization or child-led learning and colleges sometimes call it passion. It can be self-study, self-motivated, self-directed learning. These self-directed interests can develop into passions that lead to careers. The solution to dull drudgery and hated homeschooling is allowing it to happen naturally. Be warned, though! Parents often call it "frustrating, boring and annoying" if they don't have the same interests as their child. Be students of your student. Watch what they do for fun. Independent learning can be included within core subjects when the child fancies academic subjects such as history or English. For other families, the five major subjects (English, math, history, science and foreign language) are intentionally taught quickly within the first few hours of the day. The remaining school hours include high school credits collected from delight directed learning. 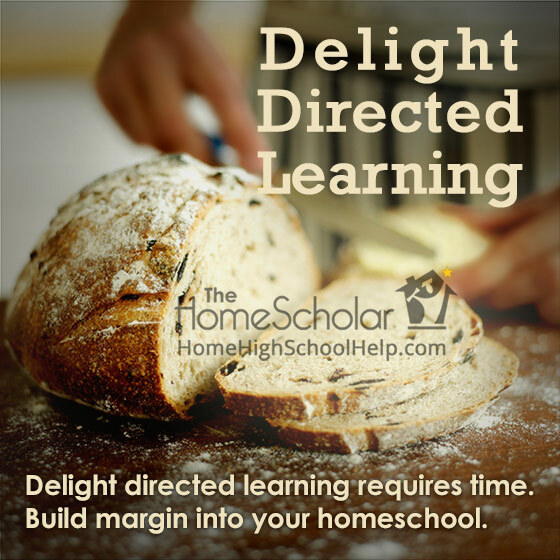 To successfully include delight directed learning in the homeschool, parents need to avoid one huge impediment to learning. That elephant in the room, the hurdle you need to overcome, is staring you in the face right now. Technology can thwart or completely shut down passionate learning. Delight directed learning requires time. Make sure to build margin into your homeschool. The overuse of technology limits free time, steals margin, and eliminates boredom. Without free time (and frankly, without boredom) children never learn to entertain themselves with interesting pastimes. To develop passionate leaners, you need to limit TV, computer, tablet, and smart phone use. A reasonable amount of technology is about two hours per day, including social media and gaming. This allows the teen enough time to goof off, but isn't so much that it impedes development of interests. If you feel as if you need help with the harsh reality of technology in your home and how to set technology boundaries for healthy and happy children and teens, check out my book, TechnoLogic: How to Set Logical Technology Boundaries and Stop the Zombie Apocalypse. If they learn it because they like it, you don’t have to teach it until they hate it. Delight directed learning occurs when a person pursues learning about a topic because they take great delight in it, not simply because it’s a required course. My son Alex was a self-motivated extreme learner. If only it were an Olympic event, like extreme sports! He learned novel writing for fun, and wanted to take a third year of French even though I didn’t have a curriculum for him. He asked for an American Government curriculum for Christmas, and read every economics book he could get his hands on. Although his “love language” is reading, he was still a delight directed learner. When it was time to make his transcript, I still had to figure out how to translate his experiences onto a piece of paper. For our family, the problem seemed huge. What should I do with all the experiences that cover a wide range of subjects? Was that report on Jean-Baptiste Say (the French Economist) a paper on history, economics, or foreign language? Was my son Kevin’s enjoyment of Russian History just part of World History, or could it be a course by itself? We had SO many papers that my children wrote that I didn’t know what subject I should attribute them to! Where should I file each of them? I eventually found a system that could help me sort out all their delight directed learning, using my understanding of traditional grades and credits. It’s not difficult once you get the hang of it. Think about any textbooks that you happen to use. Once you understand how to calculate grades and credits with a book, it’s easier to understand how to do it for delight directed learning. What if your child soaks up knowledge like a sponge, without being directed in any way? Some students learn best through living instead of studying textbooks. Can you still create a serious-looking high school transcript? Yes! However, nobody will ever know the fun or magical things your child has done unless you tell them. When speaking to colleges, you need to use words and numbers that colleges understand. Applying to college isn't like talking to your friend or a seasoned homeschool parent who understands the daily grind of homeschooling high school. Even so, colleges do understand grades, high school credits, and educational language. You need to keep those records. Once I figured out how to keep track of my kids’ delight directed learning, I realized that my system would work for all delight directed learners (not only “book learners”). I also realized that it could help parents who are kinesthetic learners themselves. My strategy is simple, fun, and only requires one small purchase. Sticky notes. Yup. Those small square notes save the day again! You can determine what to do with each experience using a simple sticky note. For each activity your student is involved in, there are five pieces of information you need to remember. Write these five things on the sticky note and save it with your homeschool records. At the end of each year, group those sticky notes together, and combine them to create high school courses. 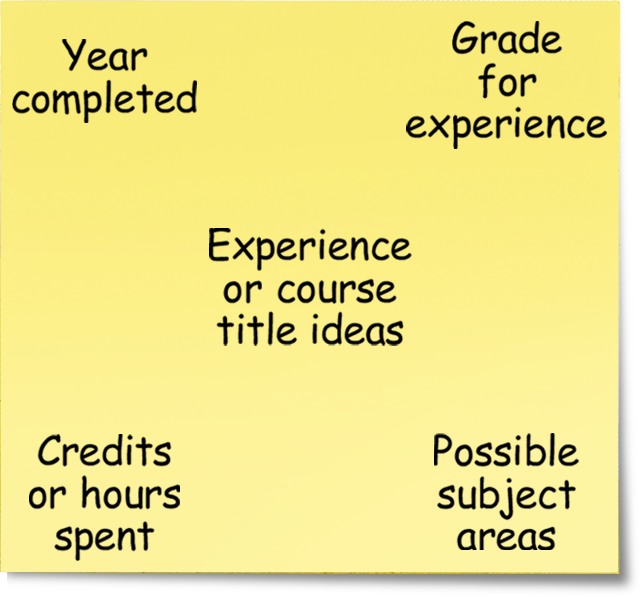 I recognize it’s hard to determine where each experience will fall on a transcript, so keep each sticky note simple. Here is what I suggest. On each note, indicate each of the following details. On the middle of a sticky note, write the name of the experience. What did the child do? “Perform in Nutcracker” or “Crazy amounts of crochet and crafting.” Do you have any course title ideas, such as “Theatrical performance” or “Creative Crafts?” Guess – and feel free to guess many times on each sticky note! What school year did your child do this? Sometimes it will be a school year, like 2019-2020, and other times it will be for a short duration, such as a play in November of 2018. Did your student complete the project to your expectations? Were they successful, did they receive positive feedback, or learn something? Remember that you don’t have to test in order to give a grade. Instead, you can evaluate them in other ways. It's appropriate to give a Grade of A or 4.0 if your child has mastered the concepts, has high test scores, meets high expectations, or loves the subject and works excessively on it. Count or estimate the number of hours your child spent on the project. A total of 75 to 90 hours could be recorded as “1/2 credit” when your child is done with the experience. If they have accumulated more than 180 hours, you could consider it a full credit. Or you might choose to divide up the experiences into smaller, bite-sized pieces and then regroup them into other courses with 180 hours apiece. If your child accumulates less than 75 hours, you will be grouping the sticky notes together. Keep sticky notes even when the activity required few hours. You can use those experiences no matter how many hours they spend. You may not know which subjects you will use for each experience, but it’s good to record the possibilities. With all our reports and papers, I often put several ideas on each note. One paper might be regarded as English, history, economics, or French. By making a note of it, I could decide later which course needed that experience to make up a full credit. If history was already packed, then I would use another subject area. Once you have completed sticky notes, don’t review them until you work on the transcript. Checking them too often can cause frustration and insecurity, so only review them when you update the transcript. This will help you keep the big picture in mind. When you are ready to work on your child’s transcript, spread all the sticky notes on the table or floor. Then put them into “affinity groups,” groups of similar things. As you combine these activities, work to combine them into groups that ultimately add up to one credit or half credit subjects. Once you have made a decision, put the course on the transcript. You can make a note of the experiences you included on the transcript, if you want to. This will help when making course descriptions. But once you’ve decided on a credit, try not to stress about it again. It’s easy enough to change when you need to, but simply sorting those experiences into groups is a success. You have successfully grouped your child’s delight directed learning into high school level courses! This whole process of spreading notes out on the floor and manually grouping and regrouping experiences is a great technique for any parent who is a kinesthetic learner. Even if you don’t use a hands-on curriculum, this hands-on transcript process can help kinesthetic parents understand the nuances of their child’s transcript, and the process can ultimately help them remember what was included in which course – and even help write course descriptions! Make sure you keep the information with your homeschool records. Another way to quantify delight directed learning is to give subject tests. This doesn’t work for every subject or every child, but it’s an option to consider. Instead of testing your child as they are learning, allow them to learn a subject naturally. When they are done, you can give them a sample test from a major test provider. If they pass the sample test at home or at the testing center, you know how much they have learned and have a grade to put on their transcript. There are three tests available that will help with this strategy: SAT Subject Tests, Advanced Placement (AP) exams, and CLEP tests from the College Level Exam Program. Parents don’t always know what their children are learning. There is so much life that goes on without parental involvement – and so many books! It’s amazing what children learn when you aren’t looking! Using CLEP exams, I found out how true this could be! I told my students to look over the exams “just to see what they were like.” One son was able to pass an exam in “Business Law,” even though I had never seen a law book in my home. He passed the “Principles of Marketing” test, even though I had never seen a marketing book in my home. He passed both “Microeconomics” and “Macroeconomics,” even though I still don’t know exactly what those two words mean. By testing them, I was able to include some courses on the transcript that were a surprise even to me! When using tests to document delight directed learning, be sure to avoid failure. Purchase a book with sample tests in it and give the exam at home first. Only take your student to an official test if you are reasonably sure they can pass. Your goal is to find out what they have learned, not demonstrate what they have not learned. For more information on SAT Subject Tests, AP exams, or the CLEP test, download my free eBook, High School Subject Tests Simply Explained: AP - SAT - CLEP Information and Tips for Busy Parents. 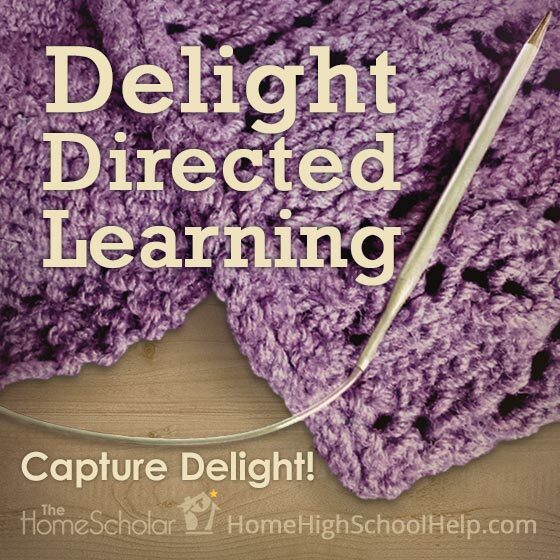 To homeschool high school effectively, include as much delight directed learning as possible. A fun learning environment does not make school easy, it makes it interesting and applicable. When school is interesting, children learn more and love learning more. Parents need to find a balance, however. College preparation means parents must cover the core classes and at the same time allow for delight directed learning. When you can, cover the core and capture delight with independent learning. When planning your week, first be sure to cover the core classes of reading, writing, math, science, and social studies. Each family has classes they consider non-negotiable core classes. Within these core classes, try to teach in an interesting way. It's possible to teach many core subjects with delight directed classes, but make sure you cover the core one way or another. Once the core is covered, capture your child’s delights. Translate them into courses on your child’s transcript. You don't have to plan, direct, or evaluate learning through tests or quizzes. Simply capture your child’s learning. This article is an excerpt taken from Chapter 10 of my book, “Setting the Records Straight: How to Craft Homeschool Transcripts and Course Descriptions for College Admission and Scholarships” available on Amazon. 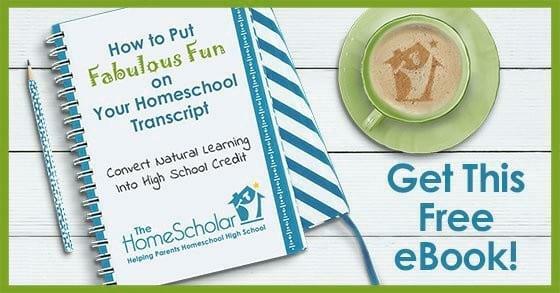 Learn how to put fabulous fun on your homeschool transcript and convert natural learning into high school credit with this free eBook. 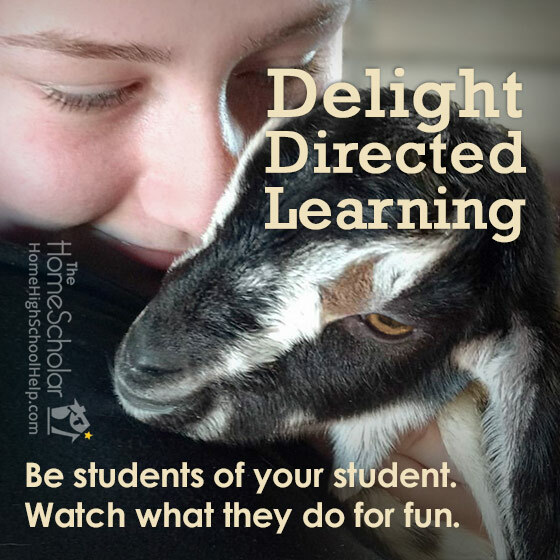 Including Delight Directed Learning in your homeschool is so important, so put those great experiences on the transcript and create a fabulous resume. This easy-to-understand eBook can help! Read, How to Put Fabulous Fun on Your Homeschool Transcript. College admission is extremely competitive! Comprehensive records will set your student apart. The Comprehensive Record Solution is geared for parents who know they need to do more than create “just a transcript.” It will enable you to create the transcript, but the focus is directed at much more, such as course descriptions, reading list, activities and award list, and work samples---all the elements that go into a “comprehensive” record. With the Comprehensive Record Solution, you will be able to create high school records that win college admission and scholarships. Get step-by-step training, cut-and-paste simplicity, and four document reviews with Lee - so you will know your records are done right!